For decades, 200 acres of land strategically located on the University of Calgary property sat empty waiting for the development trigger to be pulled. Today, University District is a massive mixed-use project well on its way to becoming the jewel of northwest Calgary offering a diversity of office, retail, and residential space as well as parks and public realms – and of course a financial return for the post-secondary institution. The estimated cost to build the entire project is $25 billion to $35 billion. “The development of University District will enhance campus life, provide more options for students and allow for additional opportunities to attract and retain world-class talent. Last year, we celebrated 50 years of the University of Calgary being part of this vibrant, energetic city,” says Elizabeth Cannon, president and vice-chancellor. James Robertson, president and chief executive officer of West Campus Development Trust, which is spearheading the project, says when full build-out is complete, in 15 to 20 years, the community will have 15,000 to 17,000 residents and employees. “The trust is very similar in concept and operations to a REIT. What it effectively does is establish a company or organization to move forward with for-profit real estate development with net profits being returned to the university,” says Robertson. “The university has no governance oversight or investment in the trust. They just receive the returns from the trust. The university guarantees the lease. The West Campus Development Trust is an independent organization created by the University of Calgary to oversee the development of the University District. “The University District is a perfect example of the live-work-play approach to developing sustainable neighbourhoods that encourages interaction between citizens of all ages from university students to seniors and provides housing choices that foster deep connections in this community,” says Leslie Shier, manager, Real Estate at Calgary Economic Development. “We did all multi-family because given our location we’re surrounded by lots of single-family housing and we believe there’s a need to create more density and more opportunity for people to have a different form of housing,” says Robertson. “So we have townhouses. We have four- or five-storey – what we used to call walk-ups – but low-scale buildings, and then concrete residential from eight to 16 storeys. That means being fiscally prudent, says Robertson, adding University District is leading edge but it tries very hard not to be “bleeding edge” so it can stand behind sound financial decisions. Earlier this year, a 3,000-square-foot Discovery Centre opened to provide project info and it includes sales centres and show suites for builders Truman and Brookfield Residential. Noble by Truman and IVY by Brookfield Residential are the two residential developments in Phase One of the project. Noble will have 136 units – 36 townhomes and 100 apartment-style condominiums. IVY will have 127 townhouses. Initial occupancy is expected to be early 2018. Future development phases include a main street to be anchored by a grocery store, a hotel, office space and seniors housing. 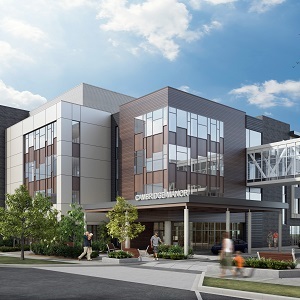 Recently, the West Campus Development Trust and the Brenda Strafford Foundation announced Cambridge Manor, a state-of-the-art senior living facility, would be built at the university. The 217,000-square-foot building breaks ground in early 2018 and is set to open in 2020. The announcement of a grocery store and commercial block will come in mid-to-late September and a possible announcement of a hotel is expected to follow in October or November.